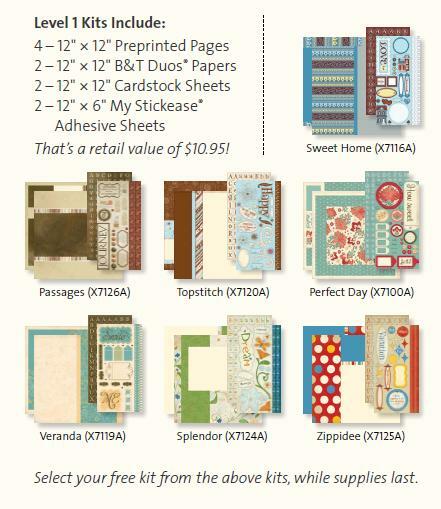 I've posted many times on my blog about how much I LOVE the CTMH Level 1 Scrapbooking Kits! They are great for beginners as the layout design work is done for you. But they are also great for people who scrapbook a TON (like me!!) too! They are a great way to get a lot of pages done quickly! So, if you love Level 1's as much as I do - - you will love this month's promo! CTMH is giving away FREE Level 1 kits with every order over $115 Cdn. (And of course - with an order of $115, you'll also receive this month's Stamp of the Month for Free (retail value $26.95Cdn) as well). Offer available until April 30th (while supplies last).